Recently I found myself at the family campground on a Saturday afternoon with nothing to do but cook and enjoy a camp fire. This may sound normal for August in Indiana, but this summer has been far from normal indeed. Drought and record heat has dominated the spring and summer until now. A fire ban for most of June and July virtually took the fun out of camping, not to mention triple digit heat. With the weather back to normal the family was out in force to enjoy the outdoors. 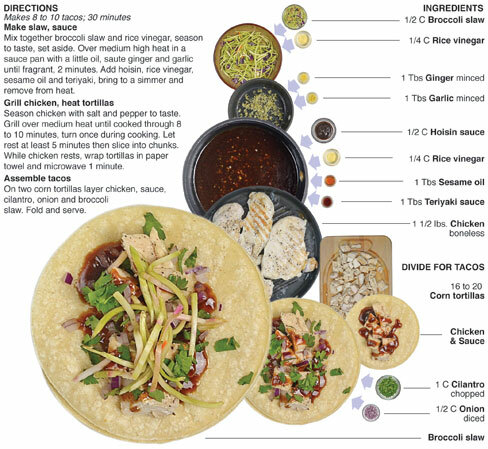 I had picked up some broccoli slaw the day before and thought it would be fun to make a sweet and sour Asian inspired taco, I have a small, but efficient pantry in my camper that allows me to go Mexican, or Asian at any time. As I was making these up I found myself enjoying the moment, like I hadn’t enjoyed in a long time. I was just cooking, no pictures or pressure to make something worthy of publishing in print or on the web. It has been a while where I have been able to let loose and cook something gourmet, just for the pleasure of it. Most of the gourmet stuff I cook I document for this blog or my print column. Everything is thought through and meticulously planned so that the photography and design or presentation of the dish is top notch - not to mention the flavor. It has to be great or generally I will not use it in print. A lot of work goes into a post like this, which I love doing. 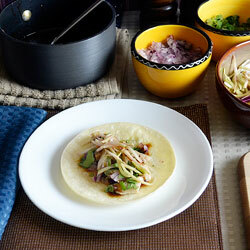 What I realized while making the tacos was it is good to just cook sometimes, no recipes, blogs or pictures. Just me working to make the most tasty thing I can possibly make - then chowing down. It really took me back to my days in New York during football season. I would have “tailgating” parties in my apartment, complete with indoor grill and cold beer by noon. I knew my cooking was starting to get good when women starting showing up to my football parties and tell me they could care less about the game, they were there for the food. At the campground, I used mini corn tortillas to get more tacos out of the batch - I churned out somewhere between 20 to 25. I ate 5 myself. The family really enjoyed this one because there was no heat. Most of the time when I’m cooking outside I tend to lean toward spicy flavors, so the ones weary of the spice were pleasantly surprised. It was such an enjoyable experience, almost therapeutic in a way. It's important to cook just because you love it every once in a while. Mix together broccoli slaw and rice vinegar, season to taste, set aside. Over medium high heat in a sauce pan with a little oil, saute ginger and garlic until fragrant, 2 minutes. Add hoisin, rice vinegar, sesame oil and teriyaki, bring to a simmer and remove from heat. Season chicken with salt and pepper to taste. Grill over medium heat until cooked through 8 to 10 minutes, turn once during cooking. Let rest at least 5 minutes then slice into chunks. While chicken rests, wrap tortillas in paper towel and microwave 1 minute. 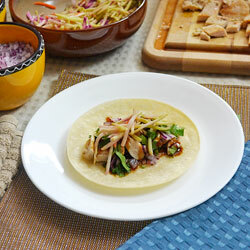 On two corn tortillas layer chicken, sauce, cilantro, onion and broccoli slaw. Fold and serve. New York City might be the capital of mobile food. The hot dog carts are famous but that is just the most basic food stand on the sidewalks of the Big Apple. Nearly every type of cuisine imaginable can be found on a mobile kitchen somewhere within the five boroughs. I lived in the Astoria section of Queens for more than 12 years and there was one cart in particular that was there when I arrived in 1997 and is probably serving food right. The cart specialized in gyros, kabobs and other Greek and Mediterranean foods. I must have eaten 300 gyros from that place and probably paid the light bill for the guy who set up, took down and cleaned his food cart night after night at the corner of 32nd and Broadway in Astoria. 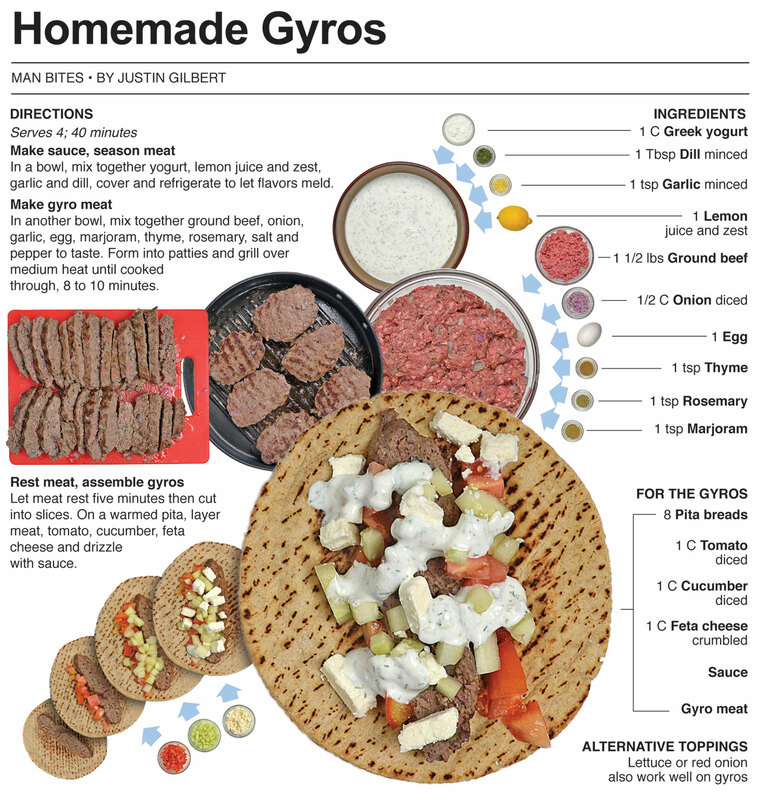 For this recipe, I make a homemade gyro. I replace lamb with beef and use a few Mediterranean spices to enhance the flavor of the meat. 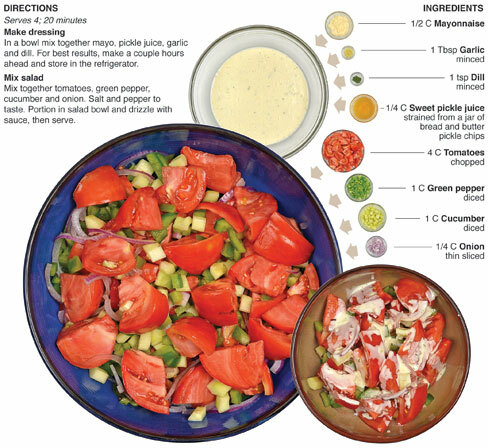 It’s topped with feta cheese, tomato, cucumber and a sauce that is a simple version of the tzatziki sauce found on traditional gyros. I loved the street food in New York and the vendor I mention in the introduction was one of the many that I frequented while living in the Big Apple. While New York has had street vendors for decades, it’s great to see it finally coming to this area. The street food or food truck movement has hit Fort Wayne and several carts and trucks run by good chefs have popped up around the Summit City. I admire these entrepreneurs, because they are really taking a chance with the concept. Most people in the midwest associate mobile food with carnivals and festivals and consider the cuisine “a guilty pleasure,” with products loaded with calories like elephant ears, cotton candy and fried snickers. The Ragin' Cajun grand opening. That’s not what these guys are serving. 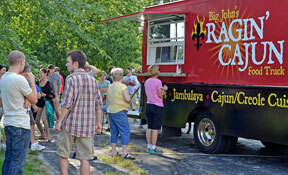 I went to the grand opening of the Ragin' Cajun truck last week and the food was absolutely amazing. I have been working with the Chef, Big John for a few weeks now. I have cooked with him at the Shiloh reception hall and had tasted his cooking for large wedding parties (which was outstanding), but the cuisine John was whipping up on the truck was truly his comfort zone. I had a blackened shrimp taco and Jambalaya. 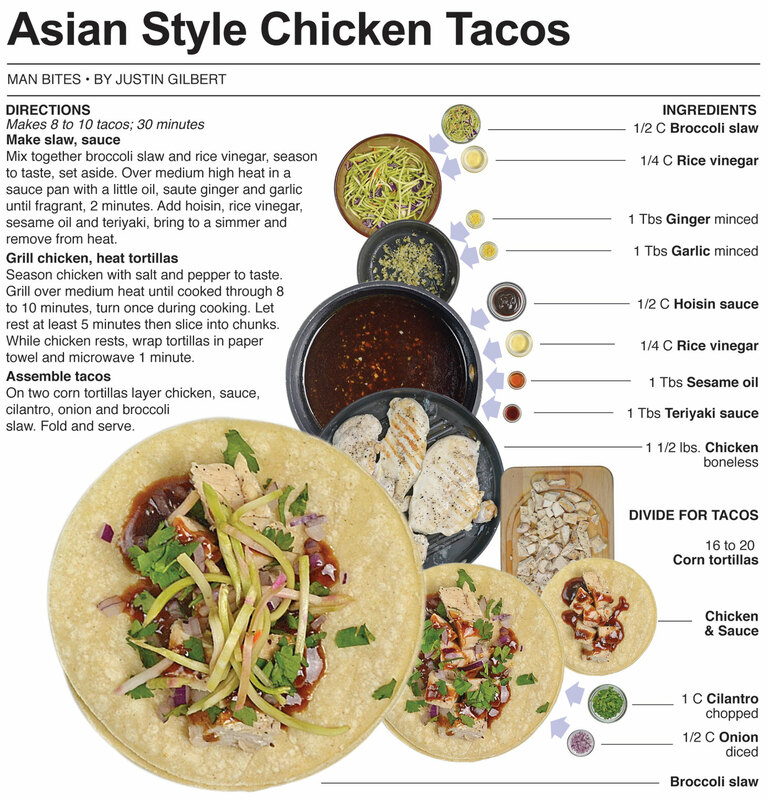 The taco was high-end, as good as any cuisine found at any restaurant in town. The shrimp was succulent and spicy but the heat was was tempered by a creamy cilantro-lime sauce that balanced the flavors perfectly. Then there was the Jambalaya. It tasted as if someone had been brewing it up on the stove all day. There were so many layers of flavor from the sausage and chicken, fresh herbs, tomato sauce and perfectly tender rice. I could have eaten an entire bucket. Overall, the taco and jambalaya was the best meal I’ve purchased in Fort Wayne all summer and I look forward to eating from the Ragin Cajun’ again. I hope all the trucks popping up stay true to providing gourmet cuisine, because if one starts frying Twinkies and snicker bars it might taint the reputation of the trucks in general and that would be sad for the owners. Big John has a legitimate restaurant on wheels and he has the chops to provide some of the best food in town. I hope all the trucks can live up to the kind of standard that John is setting with his cuisine. In the coming weeks you will here more from me about the food being served from the different trucks and mobile food vendors in Fort Wayne's growing mobile food movement. Make sauce, season meat In a bowl, mix together yogurt, lemon juice and zest, garlic and dill, cover and refrigerate to let flavors meld. 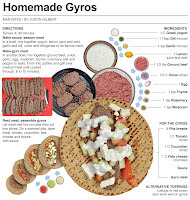 Make gyro meat In another bowl, mix together ground beef, onion, garlic, egg, marjoram, thyme, rosemary, salt and pepper to taste. Form into patties and grill over medium heat until cooked through, 8 to 10 minutes. 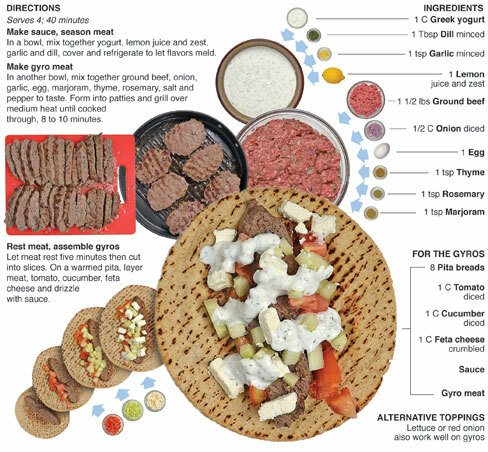 Rest meat, assemble gyros Let meat rest five minutes then cut into slices. 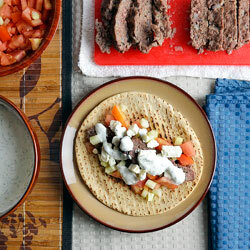 On a warmed pita, layer meat, tomato, cucumber, feta cheese and drizzle with sauce. This is a work in progress. 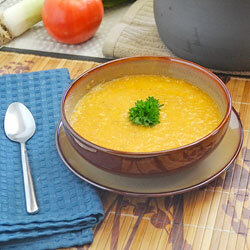 There is nothing wrong with the taste of this dish, it actually has really good flavor. It does need to be executed differently though. 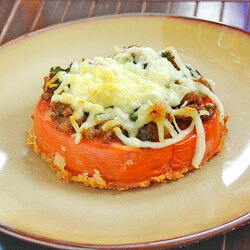 The crunchy layer of breading worked and the basil was a great flavor add. The sausage would have worked better as a patty and I think I could have melted the cheese while I fried the bread crumbs by putting a cover on the pan while the breading got crispy underneath. I don’t know if that would work though - I’ll have to experiment. If you have any suggestions on how to improve this recipe please leave a comment or send me a message – I welcome the suggestions. Usually when a recipe doesn’t work I won’t publish it, but this one has potential, and I think if I got this perfect it would be a great starter to a gourmet meal. Had the flavor not worked this definitely wouldn’t be here, but it tasted great and had the texture I wanted, but it kind of disintegrated as I ate it. That was caused by my broiler which wasn’t hot enough, it took way to long for the cheese to melt, which meant the tomato was exposed to the heat for much longer than I wanted. 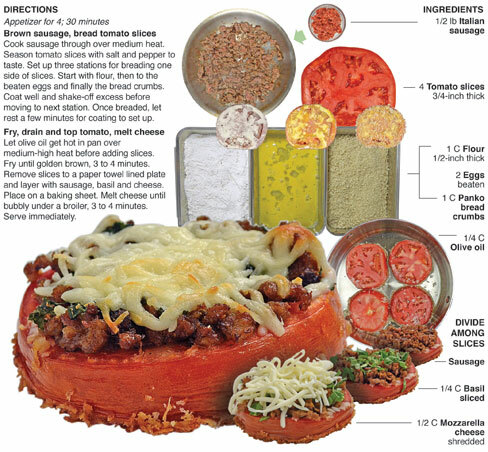 The extra heat caused the tomato to be overdone. It was still firm but it fell apart way to easy, which in turn caused the sausage to go everywhere as soon as I cut into it. This is the fifth garden vegetable recipe I have done in a row. (4th to be published here) I’m getting a little tired of them to say the least. I think I need to make a meat pie or something. I need to get used to it thought, for the next two months the garden is going to be producing some beautiful stuff. Peppers, green beans, cabbage, sweet corn, the list goes on. I’m up for the challenge. I wish there was a time of year like this for meat! Imagine neighbors bringing over extra steaks, or walking out in the yard and finding a perfect rack of baby back ribs, that would be a culinary dream land. When a rabbit hunter gets a new gun, I’ll bet he or she is as excited as a kid on Christmas morning to go bunny blasting with it. It doesn’t happen often, but every once in a while I get something new to use in the kitchen and I literally get frantic with excitement to take it home and put it to use. This happened to me last week. I have been looking for a great soup pot for a long time now. My stock pots and dutch oven are to big and sauce pans to small for my typical batch of soup. Sunday night I found one at Williams-Sonoma. It was a bit pricey so, after much contemplation, I passed. My excuse was waiting for cooler weather, which is better for soup making. I woke up Friday morning to rainy and cool fall weather. By 5 o’clock, I had the new pot and was ready to make my first batch of soup with it. 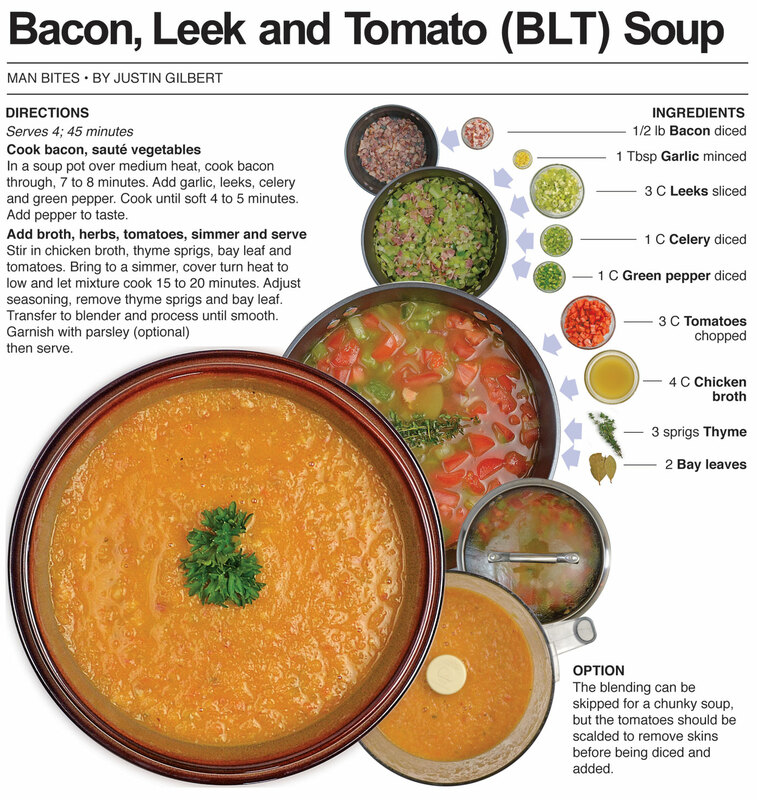 For this recipe, I make bacon, leek and tomato, or BLT soup. The recipe is delicious and the new pot is a great addition to my kitchen equipment stash. I let my dog out the morning I bought the pot and it was the first time in months that it was actually cold outside. It was a fall day in August during the summer of record high heat. It was very surreal. As soon as I soaked it in I thought about making soup, going to Williams-Sonoma and getting the pot I had passed on just a few days earlier. The weather was my excuse and that had changed! When I got to Williams-Sonoma the sales associate came right over. She was a total vixen, I knew I had made the right decision to get the soup pot. Not only was I getting new kitchen equipment, I was being waited on by a Williams-Sonoma calender girl. I told her what I wanted and she went to the back to get it. It didn’t take long for Babraham Lincoln to return with the pot in hand. She must have sensed my vulnerability, because she somehow managed to get my to buy some soup base AND sign up for a Williams-Sonoma credit card. I didn’t care though, I really couldn’t wait to cook with the new pot, I was drunk with culinary excitement. When I first started this recipe I wasn’t sure If I would be able to fit everything in the pot. I had a temporary moment of regret, but that was just a slight panic. 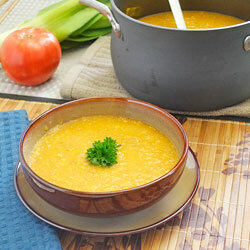 The pot was absolutely perfect for a 4-serving batch of soup. My big pots were never right because the soup wouldn’t even fill the pot a quarter of the way. It doesn't effect taste, it just seemed as though I was hauling a couch with an 18 wheeler when all I really needed was a van. Honestly, I am going to use the new pot quite a bit, because I make lots of chilis and stews and like soup, the pots and sauce pans are not quite right for making a batch that serves four. 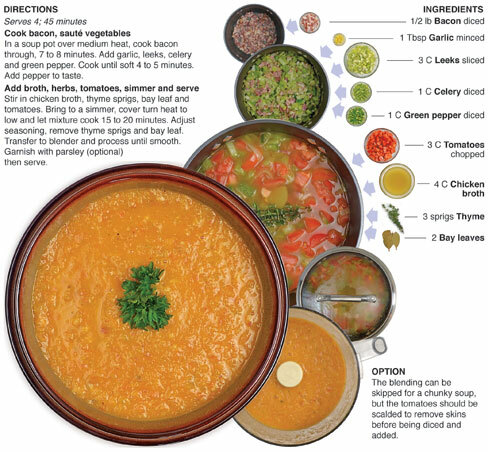 If you make a lot of soups, stews or chilis you should look into buying Calphalon's 4-quart soup pot. It’s awesome! 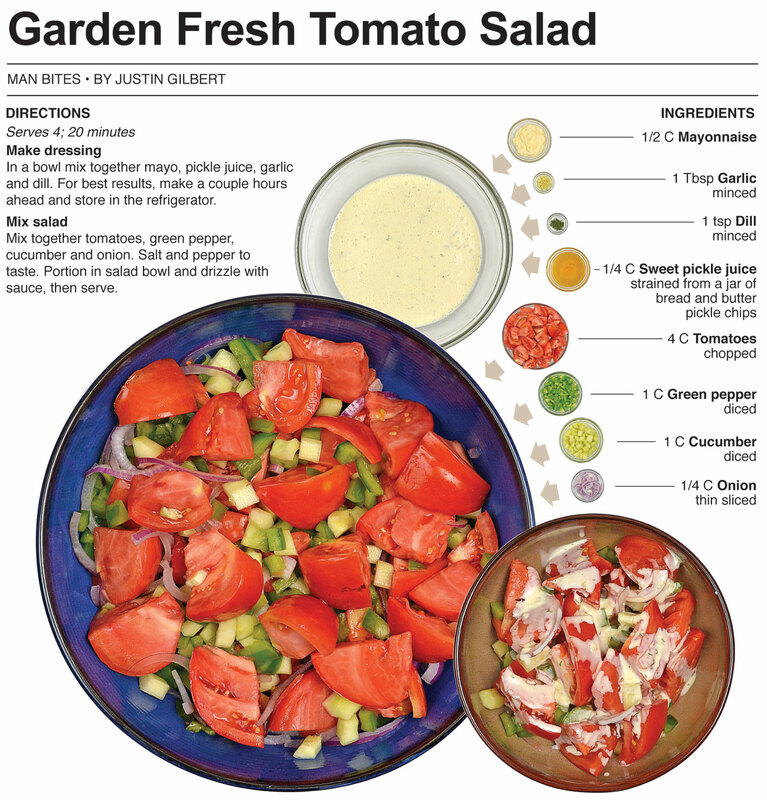 Fresh tomatoes from the garden are completely superior in flavor to what we buy at the super market most of the year. Commercially produced tomatoes are picked as far as two weeks ahead of being ripe, when the product is green in color and hard and firm in texture. This helps to prevent bruising and damage during the shipping process. Once the tomatoes get near their destination they are left on shelves in cold storage for as long as a month. Before hitting the super market they are put in a gas chamber and exposed to ethylene which artificially creates the red color and induces ripeness. The bottom line is that most store-bought tomatoes are picked to soon which is why they are loaded with moisture and watered down in flavor. 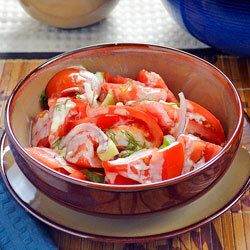 For this recipe, I use delicious vine ripe tomatoes that are grown where they are eaten. 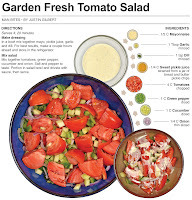 The tomato stars in a salad of garden fresh vegetables drizzled with a homemade dressing that includes brine from fresh sweet pickles I made last week. Back in February I entered a chili cook off sponsored by the American Legion Riders. Instead of using the flavorless tomatoes on the shelf at Kroger, I bought heirloom tomatoes and the taste difference was unbelievable. It really is a shame how most store-bought tomatoes lack taste. I wish that I lived somewhere that they could be grown year round because I use tomatoes a lot, and I’m not always willing to fork out the $2 extra per pound for the heirloom variety. I don’t have to worry about that right now because it’s tomato time in the midwest, and it will be for the next month or so. The only thing I have to worry about with tomatoes this time of year is the crop that goes to waste and lays in the garden rotting away. Chances are good that if that rotten tomato is found by a teenage boy he will probably fling it at a passing car or take it with him to pelt some younger kid in the neighborhood. Beware of flying rotten tomatoes. Cucumbers have begun to pile up on kitchen counters like dirty dishes at a frat house. It’s just part of the first wave of bounty surrendered by home gardens. A cucumber is delicious in a number of dishes but for most gardeners there are to many to eat all of them fresh. A great way to preserve them is by pickling, a preservation technique that dates to ancient Mesopotamia. 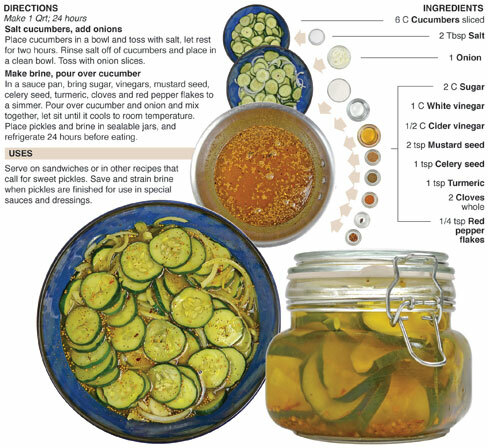 There are several different ways to pickle, but according to the Encyclopedia of American Food and Drink, sweet pickles in the Untied States took off with German immigrants known as the “Pennsylvania Dutch” who settled the countryside near Philadelphia in the early 1700s. They practiced Mennonite traditions which featured cooking that relied heavily on sweet and sour flavor combinations. For this recipe, I make sweet pickles known as “bread and butter.” The name is said to have originated two ways - either for their compatibility with bread and butter, or for the income they brought in. I’ve been wanting to make bread and butter pickles for a while now, I just had to wait for cucumbers to be in season. In my family, everyone who has a garden grows them, so I knew they would be available in abundance if I just waited until the right time. Last week my brother-in-law sent a mess home with Mom which I saw as my cue. I love bread and butter pickles more for the brine than the actual pickles themselves. I can literally drink it. The sweet and sour flavor of the juice is an amazing ingredient to add to mayo and other dressings. It’s the secret to the sauce for the Ranch BLT Dog and the New York Club Pizza, two delicious recipes that have appeared here in the past. 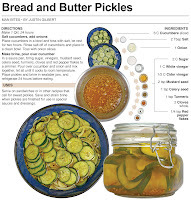 I wanted to make the pickles for myself just to have the home-made brine to use in the future. 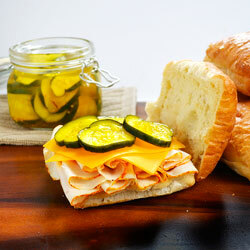 It has a little extra spice and the flavors are more intense than store-bought pickles. I can’t wait to make a sauce out of it. Using the brine is a little tip I picked up from Cuisine at Home magazine. 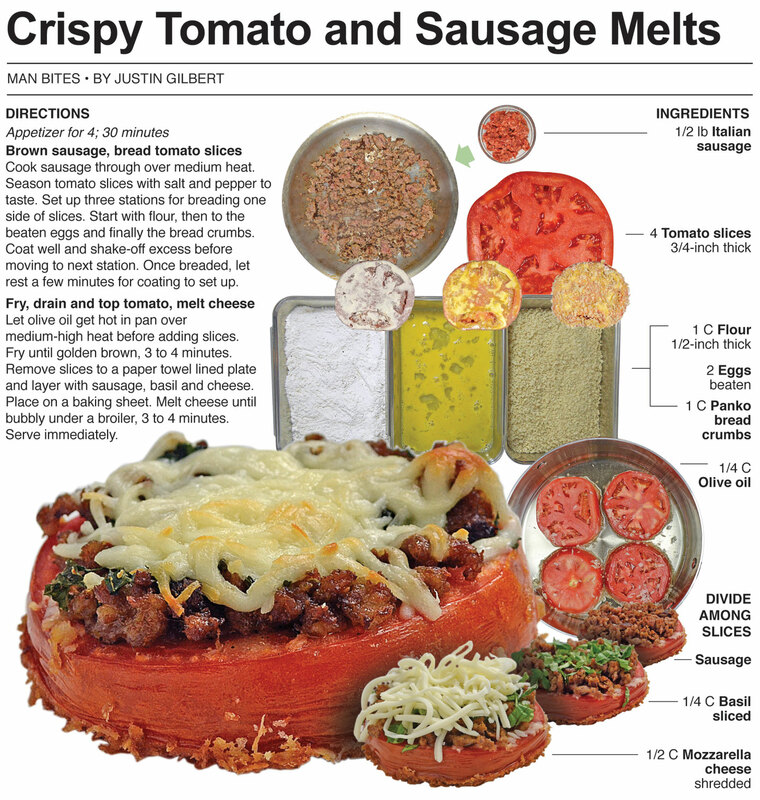 I used to make two or three recipes out of every issue and would follow them exactly. Doing that taught me so much about cooking. I think it’s important for new cooks to follow recipes exactly the first time it's tried, just for the learning experience. It’s almost like taking a class from a chef and a great way to discover flavor combinations and classic techniques. I still subscribe and read Cuisine at Home, mostly now for inspiration, but I have to admit there are times where I see one of their creations and I will create it, following the recipe to the tee, just so I can taste what the developer had intended for me to actually taste.